It’s increasingly difficult to break through the noise with folks in your network. Reps often lament that it’s challenging to get their message through to customers and prospects. Read on to discover two lesser-known LinkedIn strategies that can help you break through the noise. Receive step-by-step instructions on implementing these strategies. Click here to download the LinkedIn Tagging and Targeting Tool. These social selling strategies will also double as new sales techniques in your arsenal. Not everyone in your LinkedIn network provides you the same value. Your 500 connections don’t necessarily have twice the value as your colleague’s 250. Tagging your LinkedIn connections can uncover the true value of your network. Two months ago, I wrote about LinkedIn Tagging (click for a more in depth analysis of Tagging). With that article, I provided the LinkedIn Tagging Tool. This month I’ve updated the tool with several key new features. Now there is additional guidance for curating effective content through your tagged network. 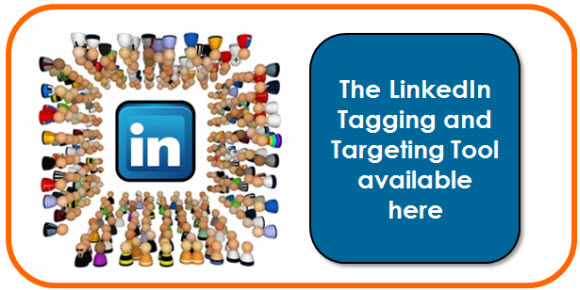 The tool included with this article is a combination LinkedIn Tagging and Targeting Tool. It provides step-by-step instructions on how to utilize both of these features. You’ll also receive tips and tricks to assist in your social selling efforts. Discover how to truly leverage the full power of social networks for professional success. Create pertinent content for your segmented groups (see: Tagging section above). Specific personas will find different content more interesting. Don’t let the opportunity for targeted messaging slip through your fingers. -Find interesting content online? Deliver this content to your groups as it’s relevant to them. You might want to target purchasing managers, CTOs, etc. This will show them you’re engaged and trying to offer them a valuable solution. -Release company info to tagged groups in your network who will find it interesting. Good examples are company updates, industry trends, and news releases. There is more information in the LinkedIn Tagging and Targeting Tool. The step-by-step instructions and sales tips will do wonders for your sales toolbox. Furthermore, the social aspect will launch your capabilities into the digital age. You’ll be a more effective sales rep, and will avoid becoming obsolete.